This Rumble ended on 2003-08-01 00:00:00.0. Quote: "Soon you shall get to do battle with our ancient enemy, the elves, beloved of Paladine." Cause of Change: Mystical spell created through the use of magic and elven blood that restores ogres to their historic titanic proportions. As a Youngster: Chieftain Donnag murdered his father and mother. Mission: Find a way to kill as many elves as possible. Quote: "Don't make me angry. You won't like me when I'm angry." As a Youngster: Bruce Banner's father murdered his mother. Mission: Find a way to control the raging spirit within him. Sneaking into a top secret military science lab doctor Bruce Banner makes his way towards an experimental machine dealing with alternate realities. Believing this is his chance to purge the Hulk from himself, Banner starts the machine and steps inside. To his astonishment he is transported to dilapidated ruins. While exploring the ruins a group of huge and twisted humanoids speaking a strange language capture him in a net and drag him for miles across a rocky ground. He is dragged through mud and refuse into a city filled with more of the ogres and delivered to the base of a newly painted tower. Around him he can see human slaves watching from behind their apparent "masters". An immense blue-skinned creature towers over him barking in some unintelligible language. Then they begin to kick him demanding an answer to some question he is unable to give them. Upset and confused Dr. Banner transforms into the Hulk. 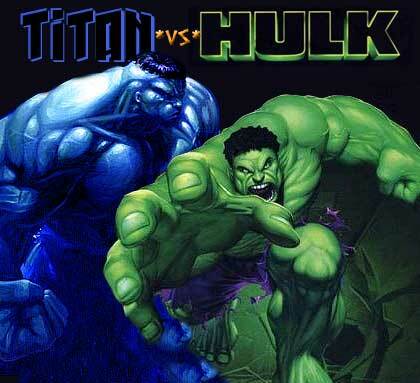 The green goliath shrugs off the net and attacks the blue titan in front of him.